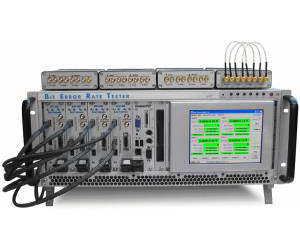 The BERT-50 series Bit Error Rate Testers handle a maximum synchronous serial bit rate of 50 Mbps per channel. The above chassis can be configured with up to 14 channels. More channels can be added using additional expansion chassis.Application software and User Interfaces are provided to control from 1 to 16-channel configurations. User input is by touch screen. The BERT-50 has a Low-Speed Interface.